It is time for a FIRST Wild Card Tour book review! 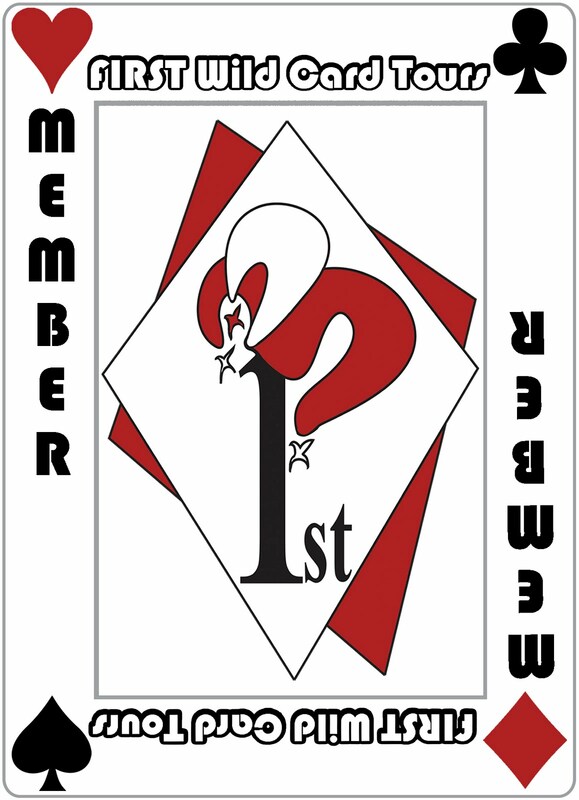 If you wish to join the FIRST blog alliance, just click the button. We are a group of reviewers who tour Christian books. A Wild Card post includes a brief bio of the author and a full chapter from each book toured. The reason it is called a FIRST Wild Card Tour is that you never know if the book will be fiction, non~fiction, for young, or for old...or for somewhere in between! Enjoy your free peek into the book!This is a must read true story. I did not expect to like this book, but I was wrong. I couldn't put it down. This is the story of the Chilean miners as told by Carlos Parra Diaz, the "Chaplain of Camp Hope". It is told by Chaplain Diaz. It is about the rescue and the faith of the miners and their community. It is a heart clincher. Have tissues on hand. After serving as chaplain at Camp Hope during the 2010 mine collapse that trapped 33 miners a half-mile underground for 69 days, minister Carlos Parra Diaz believes he is now living the answer to a prayer. Today he finds himself exactly where he asked to be placed several months before the collapse when he climbed atop a hill near his home and prayed God would use him to bring awareness of Jesus to all nations. Today, Pastor Parra, his wife Gloria and their two children live in Asunción, Paraguay, where he serves as regional pastor and missionary. In addition, he continues to share his experience with others throughout the world, diligently seeking every opportunity to spread the message of the San José Mine: that our God is a God of Love. For several suspenseful hours on October 13, 2010, the attention of the entire world lay centered on a solitary spot in the Chilean desert. It was there that 33 trapped miners emerged to fresh air and freedom and the eager embrace of jubilant family and friends, after having spent ten weeks entombed one-half mile underground. Their emergence brought an end to the greatest mine rescue of all time. 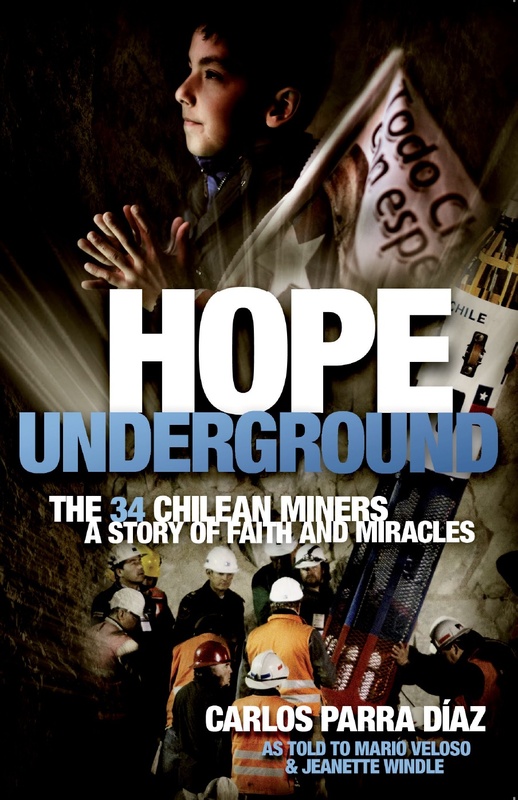 As told to writers Mario Veloso and Jeanette Windle, Hope Underground: The 34 Chilean Miners—A Story of Faith and Miracles (Imago Dei Books) records the personal journey and spiritual involvement of a local, unassuming minister with the miners and their families. In a series of circumstances that would change his life forever, Pastor Carlos Parra Diaz rose to prominence as he became the influential chaplain of Camp Hope—a makeshift tent community established not far from the site of the mine collapse. Yet Hope Underground is clearly more than just Pastor Parra’s story. Rather, it is the story of all who came together at Camp Hope focused on asking God to do a mighty work on behalf of the miners and the overwhelming evidence of His response that followed. Told simply and from the heart, Pastor Parra describes not only his own involvement with the families at Camp Hope but also introduces the reader to those miners, family members and officials who extracted nuggets of hope from the situation and then used them to instill faith in others. For most people, this spectacular rescue is already yesterday’s news. However, for the millions who prayed for a miracle, this event has become a spiritual heritage for the whole world, a stirring reminder that God listens to the pleas of His children. Though on its own, the story of his involvement would provide fascinating reading, what Pastor Parra gives us in Hope Underground is so much more. With humility and reverence, he leads us through the story of Camp Hope to a new realization that God remains a never failing presence to everyone willing to call upon His name. My own journey of faith did not begin August 5, 2010, on the dusty slopes of San José Mine, but almost forty-three years earlier and far to the south. I was born Carlos Roberto Parra Díaz on September 15, 1967, in the small, rural community of Coelemu, located 500 kilometers south of Chile’s capital city, Santiago. In complete contrast to the Atacama Desert where I would one day find myself, Coelemu is a richly fertile region of rolling hills, eucalyptus forests, green pastures and cultivated fields, fruit orchards, and grape vineyards. Nearby winds the placid waterway of the Itata River. The family into which I was born was of modest means. My father, Luis Parra, worked at many types of manual labor within the lumber industry, the region’s primary export. My mother, Ester, stayed busy running our household and rearing nine children, of whom I was one of the youngest. We lived in a small house built of wood that faced onto an unpaved dirt lane. If cramped for such a large family, we could always retreat outside to a sizable patio filled with fruit trees and a grape arbor. There my siblings and I played, climbing trees, running among the grapevines, driving tiny model cars in the dirt. My parents were devout Christians, and from my earliest childhood I attended a local evangelical church where I grew up hearing Bible stories and singing hymns and choruses. Our small town was privileged to have both a primary and a secondary school, where my siblings and I attended. The flow of life in Coelemu was unhurried and serene. Yet I was not always happy. As one of the youngest in a large family, I constantly battled low self-esteem. I had been taught the good news of salvation through Jesus Christ. I believed in the existence and power of a Creator God. But I had never placed my own faith in Jesus Christ or made any personal commitment to follow my Creator. When I graduated from secondary school at age seventeen, there were no funds available for further education. In fact, no one in my family had ever gone on to university. I had done well in school and dreamed of a higher education. But without the necessary funds, I headed instead to the nearest city to look for work. Seventy kilometers south of Coelemu, Concepción is Chile’s second largest metropolitan center with a population of almost a million people. One of my older brothers, Claudio, had already moved there. Boarding in his home, I quickly found a job. I worked hard, sending part of my earnings home to help my parents, saving what I could in hopes I might be able to study again someday. I made friends. But I soon also turned my back on the Christian upbringing my parents had provided for me. The big city was filled with temptations for a young man out on his own for the first time. When I was not working, my days soon became a round of parties, dances, and other entertainments of which my parents would certainly not have approved. Church attendance was something of the past. Once a month or so, I would travel home. My parents had no idea how my life had changed. They were simply happy their son had found work and was building a future for himself. In contrast, despite all the excitement of city life, I was not happy at all. By age nineteen, I had fallen into a deep depression. While I could point to nothing specifically wrong, my life seemed to be spiraling out of my control. I began to question whether God even existed. My self-esteem had hit rock bottom. I had a job, friends, and all my needs supplied. But there seemed no purpose to my existence, no reason to keep living. By a certain evening when I was nineteen years old, I had come to a drastic decision: I would take my own life. I’d gone out that evening to party with one of my friends. But I could not make myself enjoy the festivities. Offering an excuse to leave my friend, I headed toward the railroad tracks cutting through that part of the city, thinking to throw myself in front of a passing train. That particular night was clear of clouds, the stars bright against a black sky. It had been a long time since I’d thought of the God in whom my parents had raised me to believe, the Almighty Creator of the Universe. But as I lifted my eyes to that star-strewn sky, it was as though I glimpsed in the soft glitter of the constellations far above me a peace that I had not been able to find anywhere below on earth—a peace so vast and breathtaking, it brought sharply to my mind the presence of the God I’d learned of as a child, His pardon, His peace. I dropped my gaze from the glittering expanse of the night sky. But the moment I started looking at the darkness all around, despair once again overwhelmed me. I now know that this was a direct attack from Satan. You are worthless, he was murmuring in my mind. You would be better off taking your own life. But the God who had created those constellations and spoken to me from heaven did not abandon me now. Before I could make any rash move, the friend I’d walked out on came rushing up. Somehow he’d sensed my earlier desperation. Worried, he’d been looking for me in all the places we usually hung out. He insisted on escorting me home to my brother’s house. By now it was late at night. My brother Claudio let me in and told me to go to bed. We’d talk in the morning. Still battling despair, I went to my room. There I spotted a New Testament lying on a shelf. I couldn’t sleep, so I picked up the New Testament and began leafing through its pages. I don’t even remember what passages I read. But in those pages, I caught a glimpse of the same supernatural peace that I’d sensed in the stars. It was as though God was speaking to me again, giving me a direct confirmation that the earlier conversation we’d had was real and that He had forgiven all the wrong things I’d done over those last two years. Going to bed at last, I slept like a small child, without stirring. When I awoke the next morning, I knew I was a new person, born again. From that day, I committed myself to follow God with all my heart. My next step was to find a local church where I could once again hear and study God’s Word. Locating one some distance away within the city of Concepción, I attended there for the next year or so. Then new neighbors moved next door to my brother Claudio’s house where I was still living. They were Seventh-day Adventist missionaries, a denomination I had never heard of at that time. They were friendly and kind. Within a short time, they’d volunteered to teach a Bible study in our neighborhood, which I began attending with my sister-in-law, Claudio’s wife. After three months of intensive Bible study, both of us made the decision to be baptized as a witness of our faith. On June 24, 1989, I surrendered my life in baptism. I was twenty-one years old. From the moment I’d placed my faith in God, I’d committed my life to serve God. But I had no thoughts at that time of ever becoming a pastor or missionary. By then I’d found a good job as an administrative aide in a bank. But I still dreamed of one day getting a higher education. Then our neighbors told me about the Adventist University in nearby Chillán, a city about a hundred kilometers east of Coelemu. “But I have no funds for university study,” I immediately responded. That didn’t matter, the missionaries informed me. Then they explained to me the Adventist University’s unique system of self financing. Students could work one year for the university and then attend free the next year, alternating work and study years until they’d achieved their chosen degree. With great excitement, I enrolled, planning to study accounting, a career that would allow me not only to provide for myself, but to help my family. But by the end of my first year working for the university, God had made it clear that He was calling me into full-time ministry. When I finally started my university studies in 1991, it was in the field of theology rather than accounting. For the next seven years, I alternated between working and studying. My employment for the university was as a colporteur, distributing and selling Christian literature door to door all over the city as well as in surrounding towns and villages. God had now made clear His calling on my life. But I did not want to follow that calling alone. I began to pray that God would bring into my life the marriage partner He had for me. For five years I prayed, not only that God would prepare the right wife for me, but that He would prepare me as a godly husband for that wife. Then in my third year of studies, I found myself in Santiago, the capital city of Chile. Part of the course requirements for third year theology students was to conduct an evangelistic campaign. Among the volunteers helping at the church where I’d been assigned to preach was an attractive young woman named Gloria Angélica Montoya. From a third-generation Christian home, Gloria was a committed Christian herself, deeply involved in children’s and youth ministry within her church. She also worked full-time as a nursing assistant at a local psychiatric clinic. The following year was one of those in which I was not studying. I stayed on in Santiago, working in the literature ministry and also getting to know Gloria better. It was not long before we both recognized how much we’d come to love each other. Both of us had complete peace that God was calling us together as life partners. Gloria and I were married in the summer of 1996. We returned from Santiago to Chillán for my last year of theological studies. I graduated in 1998 and spent the next year doing a ministry apprenticeship in Concepción. Then Gloria and I returned to Santiago, where for the next five years I served as pastor and missionary overseeing a group of churches in the Santiago metropolitan area. By this time God had given Gloria and me two beautiful children: my son Carlos Malaquías (Malachi), who at the time of this book’s writing is thirteen years old, and my daughter Belén, who is now ten. In 2003, we moved again as a family to Chile’s beautiful Viña del Mar region, famous for its vineyards and beaches. Once again, I served as pastor and missionary to a group of churches scattered around the area. Traveling from one to another, I would preach God’s Word, teach and counsel church members, and spearhead evangelistic outreach into each community. It was 2009 when I was asked if I would move from the Viña del Mar region to serve as an area coordinator in the northern city of Copiapó. Moving from the lush vegetation that I’d known all my life in southern Chile to the barren wastelands of the Atacama Desert would be a shock, I knew. But I also knew God was calling me to accept this new ministry challenge. In Copiapó I would have under my supervision nine churches, including a Gypsy kangiri, as this Romany people group called their church assemblies, in the small community of Paipote eight kilometers from Copiapó. The regional capital of Copiapó is a community of about 130,000 inhabitants just beyond where Chile’s southern “green zone” gives way to the Atacama Desert. Its main industrial base is the copper, silver, and gold ore dug out of numerous mines in the surrounding area. A large copper smelter in nearby Paipote employs many local residents. Unexpectedly in such an arid zone, the second main source of employment is agricultural production. From my first visit to Copiapó, I was pleasantly surprised to find the town a green oasis, with irrigation for citrus and olive trees, vineyards, and vegetable crops coming from subterranean water sources deep beneath the thirsty surface. Beyond the irrigated zones, the barrenness of a region that does not receive a single drop of rain is immediately evident. Since my childhood in Coelemu, surrounded by forest-cloaked hills, climbing has been one of my favorite pastimes. Once I’d begun my ministry, I’d made a practice in each new place to which God moved us of finding a nearby hill to climb where I be alone with God and pray. I was encouraged in doing so by the recognition that I was following Jesus’s own example of retreating in solitude to the mountains to spend time with His heavenly Father. Shortly after arriving in Copiapó, I climbed to the top of a high hill overlooking the city, a peak dubbed by local residents Cerro de la Cruz, or Mountaintop of the Cross. The reason for its name was clear as I climbed. At the very summit of the hill, a large white cross rose against the cloudless blue backdrop of the sky. As I reached the foot of the cross, a Bible verse rose to my thoughts that God had placed in my heart and mind since the very beginning of my ministry. The words were Jesus’s own as He foretold how He would soon die upon a cross: “And I, when I am lifted up from the earth, will draw all people to myself” (John 12:32). Ever since God had called me to serve Him in full-time ministry, my greatest desire had been to see the eyes of everyone drawn to Jesus Christ, to see my Savior exalted among all nations. As I stood there praying over the city of Copiapó and the new ministry to which God had called me, I added a very specific and bold prayer request. I prayed that God would open the door for me to preach His good news of redemption through Jesus Christ, not just in the city of Copiapó, but across the entire region of Atacama, throughout all Chile, and—if in God’s sovereign will I was given opportunity—one day even to the rest of the world beyond Chile’s borders. Over the next months I was very busy in my new ministry responsibilities, visiting each of the nine churches assigned to my administration, working and praying with both adults and youth for revival in the church. Together as a united body of believers, we prayed that God would show us how we could make a difference in this city and region for Christ. Meanwhile, my family had settled in well, my children quickly making new friends at a local Adventist school they attended. When we had free time, we enjoyed hiking the hills around Copiapó as a family. But whenever I could find time, I would climb alone to the white cross on the top of Cerro de la Cruz. Each time I would pray again the prayer I’d offered up on that first day. Never did I dream that within eighteen months of the first time I climbed that hillside, God would provide a wonderful answer to that bold prayer I’d made, opening the doors for me to speak His gospel, not just throughout the Atacama region and all of Chile, but across the entire world. This book will not only encourage you, but you will be inspired and hopefully your faith strengthened. I believe faith can still move mountains as does Chaplain Diaz.I hope they make this into a movie. I give Hope Underground 4 1/2 stars out of five. Thank you B&B Media for this review copy. I am so happy I got the opportunity to read this book. I do сonsider all the іdeaѕ yоu have introduced for your post. They're very convincing and will certainly work. Nonetheless, the posts are too short for newbies. May just you please prolong them a little from subsequent time? Thank you for the post. be updated daily. It containѕ plеasant materiаl. Have you made out your Santa wish? So this is what old is like? How did you meet your husband? partner? Is your home like everyone elses? Have you started Christmas shopping yet? Nablopomo : Plane, Train, Bus, or Taxi? A new blogger - Let's show support! NABOPLOMO: What would be your last meal?